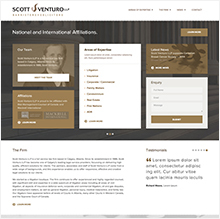 Scott Venturo needed a website that would speak clearly to all their personas and provide a simple user experience with many different paths for users to get information quickly. 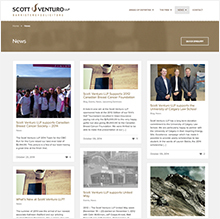 The website has its own content management system which allows Scott Venturo to quickly add new team members or make updates across any of the pages in the website. Strong branding and clear calls to action promote and excellent user experience across all devices. 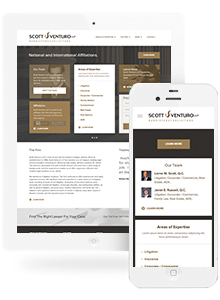 Using the latest technologies we were able to deliver a responsive website that renders elegantly on mobile, tablet and desktop devices to provide the best user experiences for their personas. 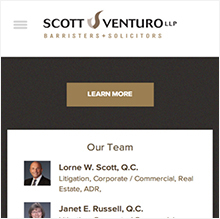 Home page has clear calls to action to each persona that engages Scott Venturo. 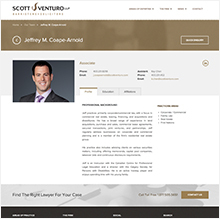 Powerful search allows users to quickly find the right Lawyer for the right case. News and Blog work perfectly from mobile devices, tablets and desktop. Responsive website rank better with Google.